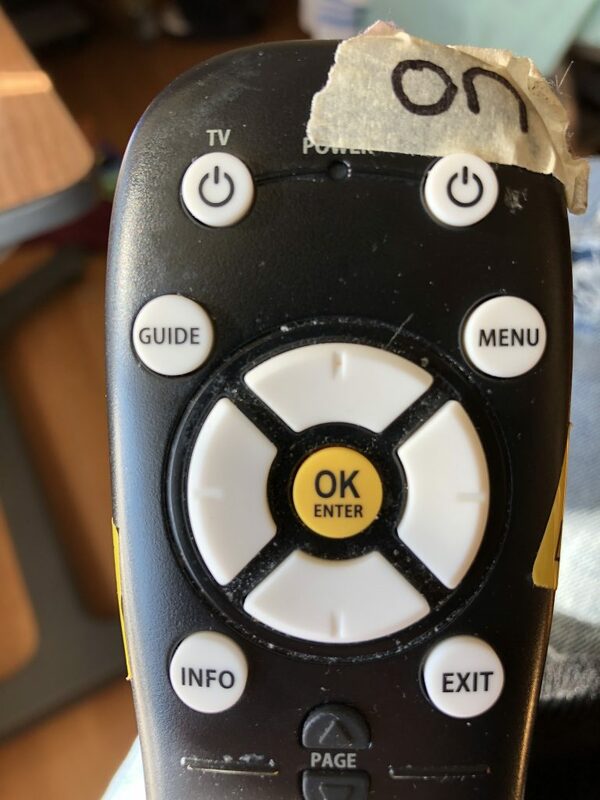 Most would recognize this remotes usage, though how you hold it correctly is often not as clear (infrared remotes need to be pointed towards the receiver), but to the aged and/or those with poor eye site these buttons don’t clearly indicate their function, so a hack is required. 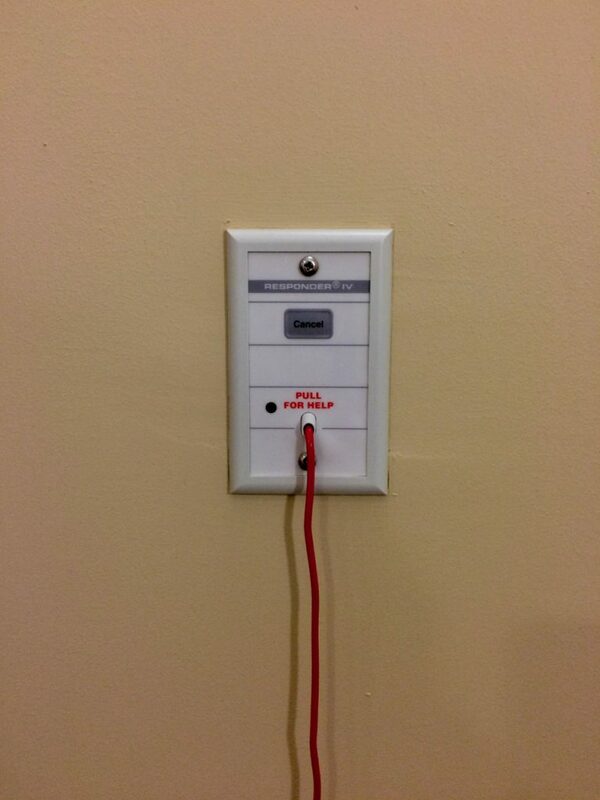 I wonder how much time was wasted helping people turn on the TV before some thoughtful nurse increased the label size. Simple UI that fits the use case – mostly. As seen in the QEH in Charlottetown. A confusing UI element in Apple’s iTunes. Clicking the button will result in an action that works as advertised, it shuffles the playlist. This button includes 2 other actions as well which may lead to confusion for many. It also plays the song list, without any indication that this is an included action. The other action is skip. While the list is playing clicking the button again will result in the player skipping the currently playing song. There is no indication that the shuffle function is active and no way to turn it off (no stop), except by going into a nested action inside the menu bar. These little details matter when delivering a coherent user experience. 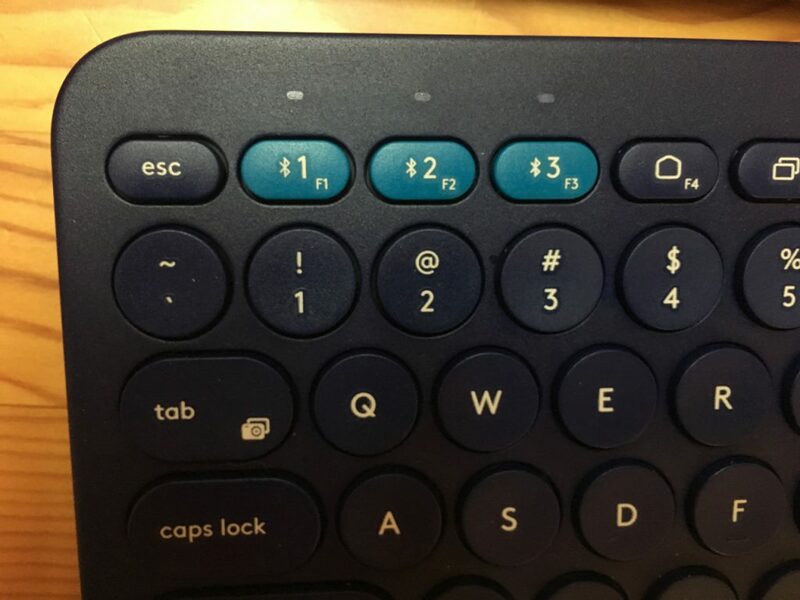 Logitech K380 bluetooth keyboard pairing UI is likely difficult for but the most advanced users. I gave this keyboard, a temporary replacement to my Apple wireless, to my wife to use with her iPad – it’s a neat keyboard in theory but I never was comfortable typing on it. She now seems pretty happy with it, at least compared to typing on glass. But for normal people this keyboard, and Apple’s for that matter, presents a UI problem. My wife wants to connect the keyboard to the iPad – at first glance how does she accomplish this task? There is nothing in this picture that supports that task, that supports her mental model of connecting 2 devices together. She knows it’s a bluetooth keyboard, so she looks through the settings app. on the iPad and finds Bluetooth settings within which shows which devices are connected. No luck there. I tell her she has to pair the devices. 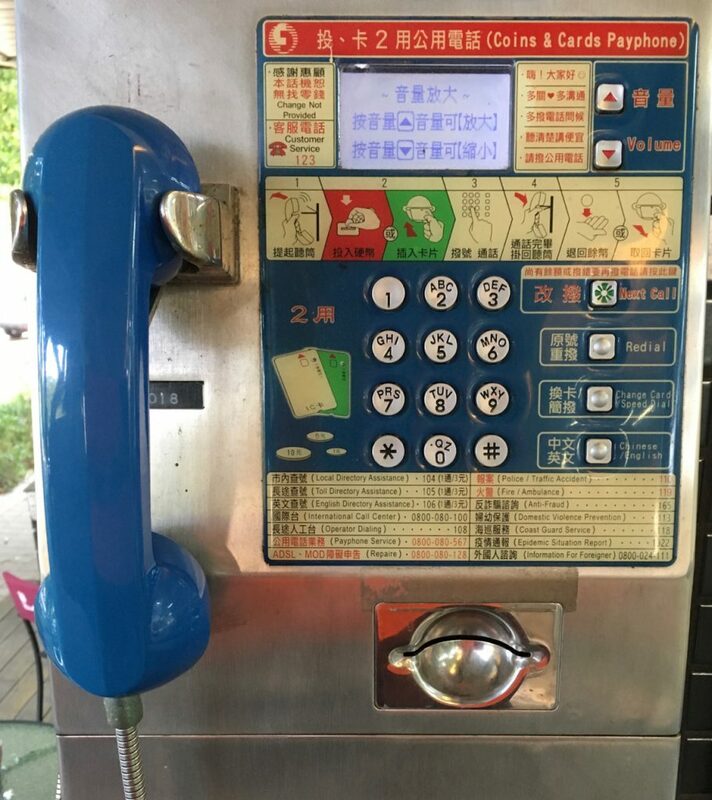 There is no UI to support that label. Because I have previously learned the UI from numerous other bluetooth devices I come over try long pressing the bluetooth icon and eventually we are in action. Known of that is at all obvious or learnable without outside guidance. Most bluetooth devices, especially the Apple BT keyboard I have, which has you long press the power button (! ), allow users to fail in this basic task. If we look to minimalistic or very simple UI the task should be automatic, like with Apple’s new EarPods. If we are unable to accomplish that then we need more obvious UI that directs the user to task completion – like a button with a label that has connect/pair or an icon with a universally accepted connect/pair meaning. The bluetooth icon is slowly becoming that symbol but I bet most people would not recognize it as such in tests. Because every person knows what he likes, every person thinks he is an expert on user interfaces. Perhaps due to the influence of Windows based software poor UI design, I often come across the common mistakes superfluous and poorly thought out dialog boxes. In addition to the maxim below, I believe we should avoid creating error dialogs when an undo will do. Unfortunately the essential undo function is still often forgotten. Dialog boxes should be action-oriented; they should help guide users towards what their next step is likely to be and it should provide them with the information that they need in order to be able to accomplish that next step. Some nice ideas but in practice I doubt I would use them. People prefer to do most of their interaction within the app itself. Notifications are simply alerts and as such don’t need to be interacted with. 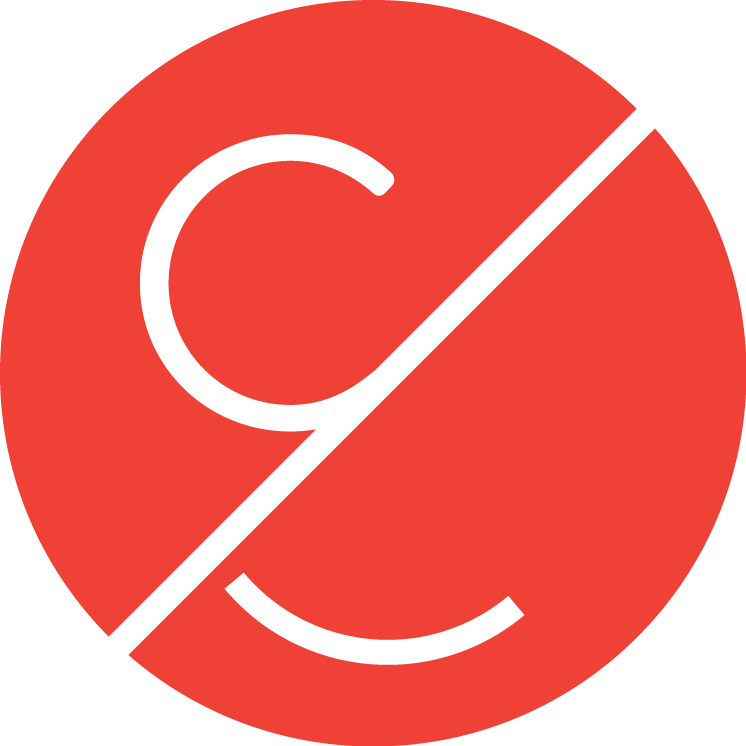 Launching the app that sent the alert is only a swipe away, that should be efficient enough. 1. Follow conventional usage, both in the choice of images and the allowable interactions. Convention severely constrains creativity. Following convention may also violate intellectual property laws (hello Samsung et al). Sometimes we wish to introduce a new kind of action for which there are, as yet, no accepted conventions. On the whole, however, unless we follow the major conventions, we are doomed to fail. 2. Use words to describe the desired action. This is, of course, why menus can be relatively easy to understand: the resulting action is described verbally. Words alone cannot solve the problem, for there still must be some way of knowing what action and where it is to be done. Words can also cause problems with international adoption. It is also the case that words are understood more quickly than graphics — even a well known, understood graphic. Words plus graphics are even more readily understood. Metaphor is both useful and harmful. The problem with metaphor is that not all users may understand the point. Worse, they may take the metaphor too literally and try to do actions that were not intended. Still, this is one way of training users. Coherent conceptual models are valuable and, in my opinion, necessary, but there still remains the bootstrapping problem; how does one learn the model in the first place? Though written over twenty years ago the logic still is valid today, many of my chief complaints with iOS 7 could be solved by following the above. For complete detail refer to the original article.